I am using Duplicati on OMV on Odroid HC2. So my OS installed to microSD card. I Am try to figure how to minimize sd card using during backups. So I guess all temp files and folders now holding on HDD, not on microSD temp. But why? 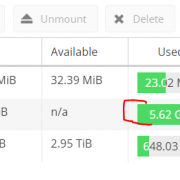 How i can find what is eating so much space on my SD card and how to beat it? Hi @Nuke, welcome to the forum! I recall reading something about Mono needing it’s own temp folder setting - is that something you can check? How i can find what is eating so much space on my SD card and how to beat it? Or if you suspect it’s all in the temporary directory, try an ls -lcrt or similar there. Duplicati-named files will begin with dup-, but it’s not clear what’s inside one from its filename, however one can test them, e.g. if a zip program opens it, it’s a zip file, etc. Or maybe the file command can help. Well, Duplicati still fills up ‘/tmp’ and ‘/root/.config/Duplicati’. Both folders on microsd card. How to change this paths? I need it on HDD. Did you set the TMPDIR environment variable in a way that Duplicati inherits it when it starts? On the usual ps command, the e output modifier gives the environment variables. If you have a different ps, I’m not sure. Please describe what sort of files you’re getting. If names are the random sort, you might need to examine. –server-datafolder: Duplicati needs to store a small database with all settings. Use this option to choose where the settings are stored. This option can also be set with the environment variable DUPLICATI_HOME.